YES, GEORGE IS GONE -- BUT YOU CAN STILL OWN THIS COLLECTIBLE TO COMMEMORATE THE END OF AN ERROR On January 20th, 2009, we still had some Bush Countdown Keychains on the Stupid Warehouse shelves. As Obama and Chief Justice Roberts stumbled through the ceremony, these keychains ticked down to zero. As happy as we were to see George go, we couldn't help but regret that these keychains had gone unsold. But we can assure you, in the near future, they will be cherished collectibles. We predict that Bush Memorabilia will become the next hot commodity. 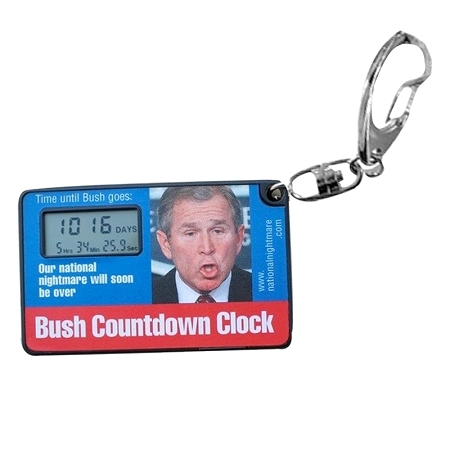 So you can now buy a genuine Bush Countdown Keychain for just $2.99!!! We sold THOUSANDS for $9.99, but you can get it for a third of that. You can still program it to countdown any event, or store it away until it is priceless on Ebay.